In case you didn't notice, I have been going through my Beatles scrapbooks and finding articles that I find interesting. Here is one from an unknown newspaper dated December 18, 1974. No woman could have been more resented than Linda Eastman when she married the last of the bachelor Beatles, Paul McCartney, five years ago. Jealous fans were rude to her whenever she stepped outside her elegant London home and the relationship hasn't improved. John Lennon's wife, Yoko Ono, and others accused her of using her influence over Paul to bring about the group's break-up. And the public only reluctantly accepted her as a musician in McCartney's new group, Wings. Linda, daughter of an American lawyer and formerly a photographer in New York, is well aware of the resentment, as I discovered when I talked to her at Paul's office in Soho this week. Wearing an original Forties dress and little make-up, she said, "the thing I didn't like was the head-on collision." "I've never really been a person who cared what people thought of me. then when I married Paul I was suddenly slagged off. That had never happened to me before. "It was like I was a different person through marrying Paul I got a bit uptight because I thought, 'Well, I'm still the same person -- why am I being attacked?' I felt people must be jealous." She is annoyed that in the West End play "John, George, Paul, Ringo and Bert," the author suggests that Paul broke up the Beatles by walking out. "He's got it wrong. In fact, Paul was the last one to leave. "It wasn't like that at all. Ringo left at one point and then came back. Then George left and he came back. Then John left and he didn't come back. "So Paul said: 'I guess I am leaving then.' There was nothing to leave. None of them were together musically." I reminded Linda of Yoko's accusation that she contributed to the break-up by interfering in the Beatles' affairs; that shew as against American businessman Allen Klein taking over the management of the group and wanted her own father to be the job. "It was much more than that," she replied. "I came along when they were all growing up, expanding their own music -- so I don't think anything really broke it up. "Before Klein came in, Paul met my dad. He's very honest and really helps people. He's on the buzz. Paul wanted the others to meet him. "Paul never cared that much who managed the Beatles, so long as he himself could have his affairs looked after. "We are all in our thirties now and I think we should have what we want. Anyway, it's coming round to everyone's being friendly again. I just feel Paul got blamed for an awful lot of stuff. "I don't think anyone should be blamed. If you are in anything and you have got partners, maybe you outgrow them. Musically, they played great together. You can't knock that." With actors impersonating her husband on stage, in London and on Broadway, people rarely stop to think what life must be like for the one McCartney who can rarely escape from the limelight. "You've got to keep sane," Linda said. "Very sane. You've got to realise life is all right, folks." "I rarely think I am going insane. I always think you must keep good in life. I didn't take very much acid, but the second trip I took in the sixties I imagined what it would be like to go insane. "I thought the worst part would be that you are dependent on everyone else. You can't keep yourself together. That's when I decided I won't go insane, thank you very much. so I haven't. 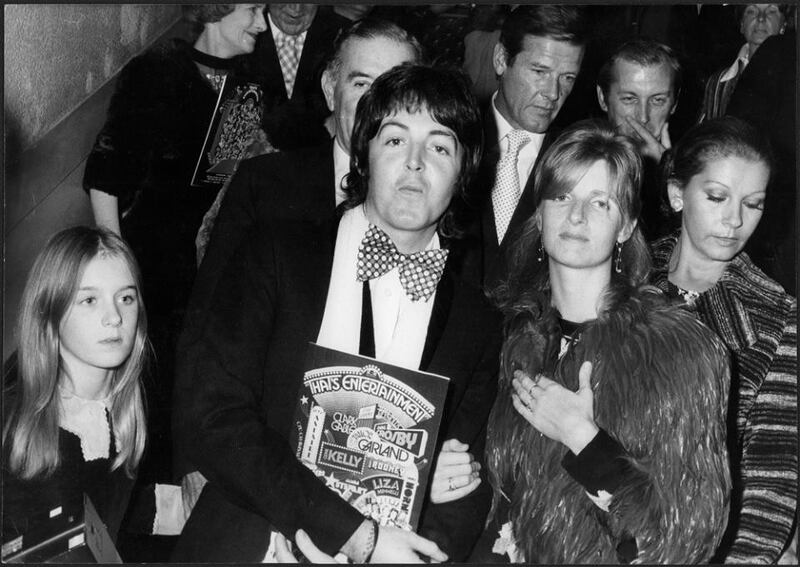 Linda surprised the pop music world when she joined up with Paul's group Wings on piano, and immediately came in for a barrage of criticism. Before that, she admits, she couldn't play a note. "We were up in Scotland. Paul wanted to play. But he couldn't think who to play with now the lads had split. "He said, 'Why don't you learn? We could do it together.' so he asked me to join the band." Linda arrived for our meeting arm in arm with her husband. They are insuperable and always seem like lovers on an early date. "No, it doesn't really scare me. I'm fatalist ---take what happens in life. If something did happen and we split...well, I wouldn't go and kill myself." Roger Moore behind Paul, and that looks like Moore`s wife, Luisa Mattioli, squeezing past Linda.